Description: This is supposed to be the "rear" of the train, see the FRED mounted on the coupler? Description: A northbound manifest sit in front of the depot and old Fred Harvey House in Guthrie. Description: Northbound manifest sitting next to the old Fred Harvey House in Guthrie. Title: BNSF ES-44DC #7678 leads a westbound at Jarales Rd. Description: A GEVO leads some more Dash-9's pulling BNSF Train Q CHILAC2 29 towards LA in a hurry. Description: JB Hunt stacks are going west, United Parcel trailers are going east, and in the far background, baretables are waiting to be switched into the yard. The stacks on the right are waiting for clearance to Hobart, while the "Citcom Job" on the far left is about to block us on the platform. The Z train is creeping through, but picked up speed as it passed us. BNSF #7678 came onto the property February of 2005. Description: BNSF Z-CHCSSE8-28A - Georgetown - BNSF Seattle Subdivision. 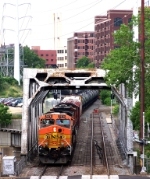 Title: BNSF 7678 and 7043 work dpu on this eb grain train.